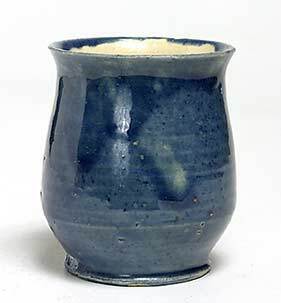 Small Farnham pot - 2¾" (69 mm) high. Farnham Pottery was founded near Farnham, Surrey by Absalom Harris in 1872. Its early work was utility wares - drainpipes, tiles, etc., but in or around 1880 Harris was asked to copy a French vase. After much experimentation he managed to produce an acceptable facsimile using a lead glaze made green by the addition of copper oxide. From that point the production of art pottery featured more prominently in the company's agenda, and Farnham Greenware, as it was known, established itself. A strong connection with Farnham school of Art was formed, which lasted well into the twentieth century. W H Allen designed for Farnham from the turn of the century until 1943. The pots were sold at Heals and Liberty - a sure sign of approval. The company was widely known for its 'owl jugs' which were produced up to the 1950s. The owl, in nature, is pretty much jug-shaped, and the simple design was a winner. Today the company produces only horticultural wares. Richard and Geraldine are Farnham collectors - take a look at their pages at www.hoggie.demon.co.uk/farnham/.